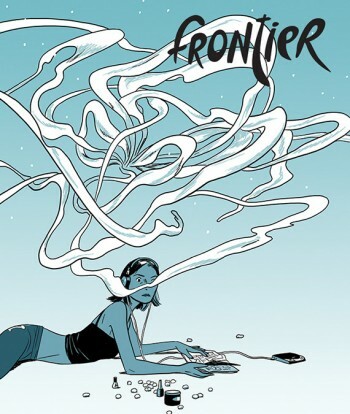 I was one of several comics industry people lucky enough to receive a copy of the seventh issue of Frontier, featuring work from the artist and cartoonist Jillian Tamaki. It debuts this weekend at the MoCCA Festival at the Youth In Decline table. I think everyone should buy it. Here's as many reasons as I can think of on a Thursday afternoon. 1. It's really good. Tamaki's story of an early-Internet based phenomenon turned eventual cult is fun in its particulars and touching in its specific. You can read it as science-fiction style story and you can also read it as a character piece. It feels like pages detached from a larger and grander story, although I would not be surprised if we never heard from this setting and these characters ever again. It is assured, confident work. 2. Its publisher could use the support. Youth In Decline is Ryan Sands' publishing house, and he has traveled frequently to support YiD's early releases. It's not cheap resources- and time-wise to publish comics, particularly when you start up basically from scratch. Sands has a strong, specific point of view in terms of what art is important to get into folks' hands, and he has been creative bringing his comics to market. My understanding is that he's a virtuous publisher in terms of paying people on time. I want Sands to have every hit possible because I'd like to see what he's going to do. 3. It's a comic book. I love comic books. I love alt-comic books. I think it's a useful format in terms of allowing people access to a specific marketplace and customer and if you can get past certain sales plateaus, it's a format that can work very well in terms of getting money to creators. Just ask Image Comics. 4. Jillian Tamaki built the bulk of her career-to-date in New York, and I believe will always be thought of that way, if only a little bit. I don't know, this is a minor thing, but I always like it when I can buy something that has some connection to the city where the show is taking place. 5. It's a lovely object. Unlike a lot of books you find at comics shows, this issue of Frontier is easy to carry around and it provides value despite its modest appearance. I'm going to buy another one and gift it the next time I'm in the same ballroom with Ryan Sands. 6. I think its message speaks to right now. There are a number of ways to intepret what Tamaki's put down on paper, but I'm fascinated by the idea of status that keeps recurring, and how thoroughly entire enterprises can be understood by providing meaning to the people that consume it. A piece of art with multiple entry points that speaks to younger people differently than it does the olds, that could be several items of meaning from my own life and I imagine one or two from your own. 7. 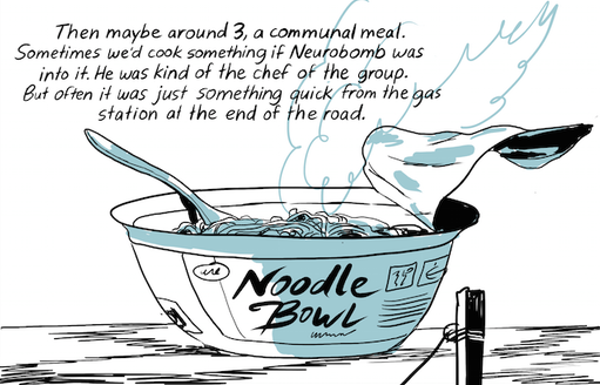 You get to be a part of Jillian Tamaki's monster year. Between this new work, a collection of SuperMutant Magic Academy and the lingering glow of last year's well-received and awards-eligible This One Summer, no one's status is as likely to change in how we perceive them between now and October than Tamaki's. She's the real deal.